This man is the Guardian, he was part of a tribe called the Locusts, and true believer who followed the ways of Zoot. His goal - to avenge the death of their saviour, and to carry out his wishes for the world. He is marked out from his followers by white robes, where the Chosen wear black or more commonly blue. Wise, well spoken, determined and at times a little unhinged, he is 'The Guardian of the word of Zoot' he will do whatever it takes to achieve his goals. First seen at a sort of prayer circle/ceremony when the watcher (a Chosen member whose devotion was to watch for the sign) comes to him in a procession of devotees with flaming torches and tells him simply 'its time.' 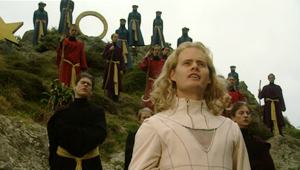 He leads them away from the circle followed by the torch bearers a determined movement to his step, later a purification ritual takes place and the Guardian, after calling on Zoot to hear them announces to his brethren that the journey, their journey has begun. He leads his followers from their camp stopping to perform another ceremony in which a follower estimates their journey by the stars and it is confirmed that they are heading for the city when the Guardian announces to the heavens that they (The Chosen) will 'bring home the sacred one' lifting up a makeshift cradle. The journey that follows across the 'sea of change.' 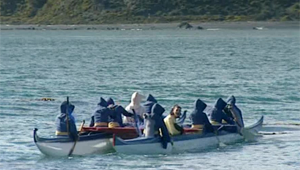 brings them to 'the land of the heathen' the shores of one of the beaches near the city, on land it seems their numbers lessen as only a small number follow the Guardian up the beach. After scaring the news about the tribe leaders meeting, as well as the fact the Mall Rats are in charge out of a street trader they display to the 'heathens' (city leaders) their devotion, appearing before them and refusing to speak or in the case of one follower to be given the 'poison' known as the antidote to the virus, they face Danni's 'kindness' with silence 'for they are the chosen.' His devotion is met with a huge funeral when he inevitably dies of the illness, having put the city on warning the Guardian begins his work. One of the chosen liberates the divine child Brady from under the nose of her watcher Patsy, her mother and Zoot's brother. The Guardian cleanses her of the taint the 'heathens' put on her by removing all traces of them, and the city. The Guardian adds ominously 'Soon Mighty Zoot, you will be reunited with Brady.' The Chosen take provisions from the farm now tended by Dal and the Guardian finally speaks to a Mall Rat, Dal sparks the Guardians anger condemning himself by his own mouth when he tells them that Zoot is dead and he knows because he was there and helped with the funeral. Dal escapes, and the Guardian does not allow his brethren to pursue, a cowardly Mall Rat is nothing to them . After the attack on the farm, the Mall Rat's send out search parties to look for Brady, now that they believe she is being held by followers of Zoot. The search is lead by Ebony former leader of Locusts, and woman of Zoot. Ebony finds the Chosen at their bunker by the city's boundary with the forest. She had (so she says) expected to find them there, as they are mid ceremony she listens, where as before when speaking to Dal the Guardian referred to his followers, and himself as 'the chosen' through the ceremony. The Guardian finally identifies himself as 'The Guardian of Zoot's word' and his followers as more than just chosen but 'the Chosen of Zoot.' Who will inherit power and chaos. 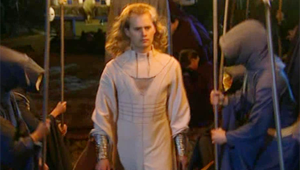 He presents to them Brady in her ceremonial clothes. Without a thought Ebony confronts the Guardian who is surrounded by the Chosen. They begin to chant 'unbeliever.' Ebony fends them off asking if they know who she is? 'your nobody Ebony, not anymore.' The Guardian informs her calmly, when he questions her about coming to them she says she is there to see 'Jaffa', and the Guardian demands she not call him that, as he no longer uses that name. After questioning the 'set up' The Guardian has, and responding to the fact she once believed in Zoot herself with 'that was then' Ebony proposes a partnership, she and the Guardian join forces to take the city. The Guardian uses Ebony's greed for power to bring the mother (Trudy) to them, to complete the sacred triangle. 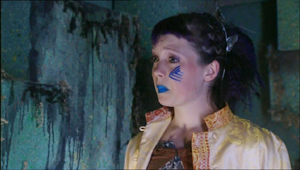 Ebony succeeds in bringing Trudy to the Guardians ambush in the forest near the bunker, but finds that the Guardian never intended to partner with her, 'There are no deals with the unclean and impure', and she is chained to the wall, as the Guardian greets Trudy, who, is afraid for her child. He says taking a handful of ash from the fire, Ebony fails, and is taken away. Ebony is brought to Trudy for judgement does the 'false prophet' live or die? Trudy stalls, and as she sees it buys Ebony time (As Ebony says, Mall Rats don't kill). While chained close Ebony reveals some home truths to Trudy including the fact that though Trudy doesn't recognise the Guardian, they went to school together, he was in the same class as Ebony, and Zoot then Martin, and was there on the day Martin made his speech about the end of the adults, and power and chaos. The Guardian known as Jaffa at the time was enamoured with Martin/Zoot's words and is among the first to stand up and join the cry. Trudy demands Ebony be removed from her sight, only to wake the next day to find Ebony chained to the wall. When she again pleads for mercy on behalf of Ebony the Guardian is wary and tries to convince Trudy that Ebony does not deserve dignity, or mercy. Trudy, however, decides to make the former Loco her servant, and the Guardian is forced to obey her wishes. Ebony and Trudy scheme a way to escape. Trudy makes a diversion, and Ebony manages to get away, leaving Trudy. The Guardian, confronts Trudy with Ebonys escape. Trudy asks the Guardian about his ability to protect herself and Brady, he looks close to losing it, but swears a mistake like that will never happen again. When Ebony fails to appear with a rescue party the Guardian continues with his plans. 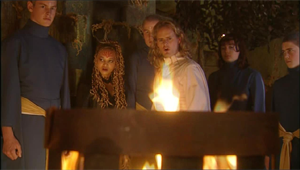 Trudy pleads with the Guardian to let her go, so that she can get Brady the antidote, to which he replies that the antidote is a lie, as they speak Trudy is given robes to wear upon being welcomed into the family of the Chosen. The Guardian attempts to persuade Trudy that it would be in her best interest during her welcoming ceremony when she asked what the one thing she desires is to reply power and chaos, and leaves her to prepare. Trudy complies with his will, and back in 'her room' in the tunnels he congratulates her, explaining that he knows leaving the old life is hard, but her new life, with them is the real one. Trudy again brings up the antidote, and he again attempts to explain that the antidote is a lie, part of the old life. With the supreme mother and the divine child together, and under his guidance and protection the Guardian, and his followers leave back across the sea of change on the pilgrimage, but not before a confrontation with Bray and Ebony in which the over zealous nature of one of their own (another set up from Ebony) tips the balance in the favour of Zoot's Chosen, playing on Brays (and Trudy's) weakness and inability to let anyone even a constant enemy die sends Trudy back to them and allows them to be on their way. 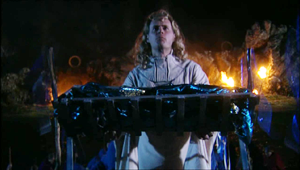 It is interesting to note that it is Lex beaten, and on his knees in episode sixteen, who first uses the name fruitcake to describe the Guardian.